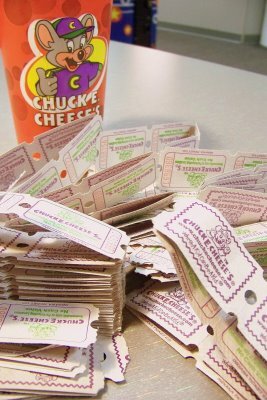 If you have ever been to places like Chuck E. Cheese's, Billy Bob's Pizza Wonderland, or Dave & Busters, you know they have various games that issue tickets that can be redeemed for prizes. Children receive tickets (usually a few at a time) and then exchange them for plastic spiders, stickers, or if they are really fortunate a small stuffed animal. After a recent trip to Billy Bob's it occurred to me, this approach is essentially what GOP Vice Presidential nominee, Rep. Paul Ryan, has proposed to "reform" the Medicare program. Medicare of course is the primary source of health insurance coverage for nearly 45 million Americans - including nearly every senior citizen in the United States. Ryan proposes that instead of receiving insurance coverage through Medicare, seniors would instead receive vouchers (known as "premium supports") to use to purchase their own health insurance from private, for-profit insurance companies. After years of payroll deductions for Medicare, instead of insurance, seniors would get a voucher to redeem to a private for-profit insurance company. The insurance company executives would receive a huge influx of government funds for their new customers, and seniors would be left to hope that they have enough Chuck E. Cheese tickets er... "premium support vouchers" to purchase the medical procedures they need. So, instead of 6, 7, and 8-year-olds asking the man behind the Chuck E Cheese's prize counter if they have enough tickets for a new yo-yo, the Ryan Medicare plan would have 70, 80, and 90-year-olds asking their insurance company if they have enough vouchers for a hip replacement or heart catheterization. On Saturday, Mitt Romney named Paul Ryan, the architect of this flawed plan, as his Vice Presidential nominee. If elected, he would be a heartbeat away from the Presidency. Sorry Governor Romney, but I am pretty sure voters don't want to play games with their parents' health care. Redeeming tickets may work in an arcade, but it is a very bad approach to financing health care.